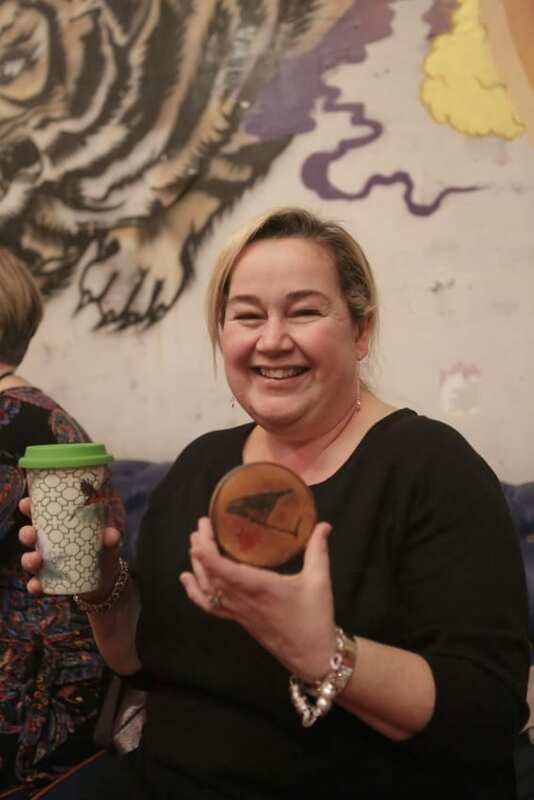 Last Thursday I went to meet interior designer Danielle Proud at a Kenco coffee and craft event at the amazing Proud Gallery in Camden What a venue ! Proud Camden is located in the 200-year-old Grade II Listed Horse Hospital in the Stables Market in Camden. We met in a very funky freshly designed old stable, with a a bar and music. What an amazing place Danielle has designed I have never been a in a club like this! Now I know an interior designer, coffee and a thrifty mummy blogger seem rather unrelated but actually it was a great fit! Danielle is a designer passionate about the environment as well as design so she is the perfect choice to spearhead Kenco’s reward scheme which combines the two. She taught us how to make our own coasters from wood found in her garden, I loved this combination of using natural resources and design. Danielle Proud, Amanda (the Ana Mum Diary) Jen (Love Chic Living ) and me! I love good coffee but I hate the throwaway nature of the ‘coffee on the go culture’ we live in and I resent paying over £2 just for a cup. Often though I do want a coffee on the go and reusable coffee cups with seal-able lids are a great solution. Danielle has just designed a gorgeous bird motif eco-cup for Kenco which is now part of their Customer rewards scheme. It is beautiful and so much nicer to drink from than a flask or paper container. Kenco have recognised that we are fast becoming a thriftier, greener nation and have responded in the lovely rewards they are sharing with their customers. All you have to do is buy Kenco as usual and put the code found on the jars into an online account. When you have enough points you can choose a reward. It’s very simple. What is great about this scheme is the classy quality of the rewards. All the rewards in the Kenco rewards programme are made from recycled or sustainable materials like the coffee cup designed by Danielle. There is a rather gorgeous Jamie Oliver carafe and glasses I have my eye on too. These are rewards you actually would be happy to pay for. Better get drinking some more coffee.